Darby School District has many great qualities. Fantastic teachers, a caring support staff, an active board of trustees, enthusiastic coaches, a driven administration, responsible bus drivers, hard working custodians and a school foods program that is becoming a role model in the state of Montana. We also have an amazing adult education program. The adult education program runs so smoothly and effortlessly that we often forget about all the hard work that goes into the program. Adult ed is one of the school’s best connections with the community. We open our doors most afternoons and evenings as the parking lots fill up for pottery, pilates, zumba, cast iron cooking, computer classes, political discussion classes, book club, fly fishing, and on and on. 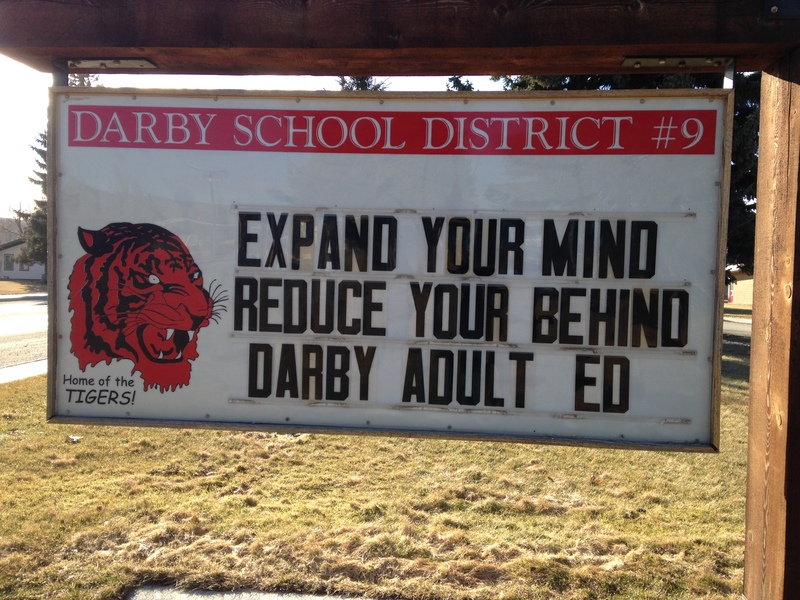 Here’s the link to the Darby Adult Ed Winter/Spring 2015 schedule. I’ve taken several adult ed classes and only failed two. My good friend is the pottery instructor. The biggest thing I learned from her class is that I am not a hands on creative artist. I need a pattern to go off of like in knitting. I failed to create a blob of clay into something recognizable. It would have been more fiscally responsible of me to pay the teacher to make me something than to spend my money on the class and supplies. The instructor said I was the first person to return all of my leftover clay and supplies back to her. Students love her pottery class and it was one of the most popular adult ed classes that was offered. The other class I failed was volleyball. I love sports but volleyball never clicked for me. I am more of a throwing the ball athlete, not hitting it with the tender soft spot on your forearms and wishing you had worn long sleeves. You must be constantly looking up to perfectly set the ball to a tall player remembering to finish the set with jazz hands. For the Spring 2015 adult ed session I’ve decided to propose three classes of my own. In a previous post “Career Adventures“, you will remember, that my goals were to be an entrepreneur, adventurer and writer. Offering these adult ed classes will fulfill all three. Entrepreneur (make a little extra cash and serve as a networking opportunity), adventurer (I’ve never actually played pickleball or indoor ultimate frisbee, what could be more adventurous than teaching as you learn) and writer (although I must be careful not to get run out of town by writing about Darby and its people, I believe that these classes could lead to some excellent writing topics for future blog posts). Pickleball was brought to my attention by my dad who is an avid player of the sport. He always has his pickleball paddle and pickleball ball in the trunk of his car. He plays several days a week and in tournaments, usually with a doubles partner. The game is a cross between tennis, badminton and pingpong. The court is a third of the size of a tennis court, the paddles have a short handle with a head almost the size of a tennis racquet but looking like a ping pong paddle. The ball is a plastic wiffle ball and there is a net similar to a tennis court. You can easily convert a tennis court or a basketball court into a pickleball court. You can play singles or doubles. The United States Association of Pickle Ball, USAPB website is a great reference for court size, rules, and supplies. I did play ultimate frisbee once several years ago at a cousin’s wedding. We were all playing in dresses and tuxes at the Daly Mansion. It was one of the best weddings I’d ever attended and I’ve wanted to play ultimate frisbee ever since. This game is similar to soccer but with a frisbee. There are two teams, each team trying to get the frisbee to a player in the end zone. You can’t run with the frisbee, you can only throw it. You can run if you don’t have the frisbee trying to get open for your teammate to throw it to. This is a fast paced game and can be played inside a gym or outside on a large field. I do have some experience in running. I’ve been running off and on for almost 20 years. I’ve run several half marathons, a ten mile trail run and numerous 10K and 5K runs. I recently completed my fastest 5K at the Diva Run in Missoula but normally I’m a pretty slow runner. This past summer I got to experience the joy of running with a group. Three of my running friends and I ran in the mornings for several months and I attribute that group running experience to my fastest 5K run. The adult ed running club will meet at 6am three mornings a week, the last meeting being a field trip to the Missoula River Bank Run in May. I will have two assistants (they are unaware of this) the pottery teacher whose class I failed and the high school PE teacher. I’m not sure I will find 7 people willing to go running at 6am. Every adult ed class has to have a minimum of 7 students or it is cancelled. No worries. If three sign up we will still have a running club it just won’t be an adult ed class. I highly recommend running with a group and make sure you invite some talkers to entertain you. One of the very best books I’ve ever read is “Born to Run“. It’s a good book for runners and non-runners alike. This book explores the runners of the Tarahumara Indians of Mexico’s Copper Canyons. They run hours per day for their commutes, eat pinole and chia seeds, drink homemade beer and run on hand made sandals made from old tire rubber and string. Another great book for runners and those wanting to take up the sport is “Chi Running” a book on how to run effortlessly and pain free. This book will help you work on your form for the most efficient and safest way of running. “Chi Running” takes you to a new level of running. You should be excited about your daily run not dread it and this book will help take you there. Check out some Adult Ed classes in your community. It’s a good way to get you out of the house on a long winter’s day and meet some new people. You can’t sit on the couch reading all the time; get out and have your own adventures. Stay tuned. 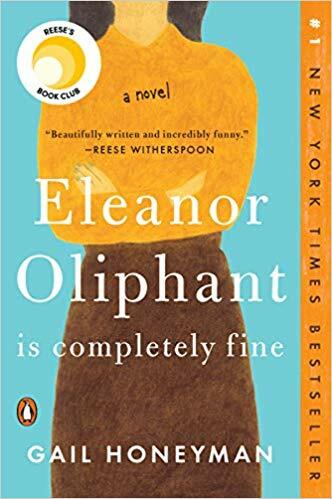 The next post will be the Wild About Books February book selection. I think you had your best time in the Diva day race because of the costume. And because I was somewhere back there chasing you.